Crammed with traveling bags, an ‘audi’ car had been driving us southwards along mountain roads crossing the Ferghana Range for more than an hour. At last I could feel that the long expected journey to Gorno-Badakhshan had really begun. Though, this trip had pleasant surprises even before we set off for it. And the greatest one among them was our meeting two foreign travelers in Almaty – Herman from Norway and Peter from Germany . These two fellows had been cycling all over the world irrespective of each other for months. Fate brought them in Almaty together with us, going to Gorno-Badakhshan. 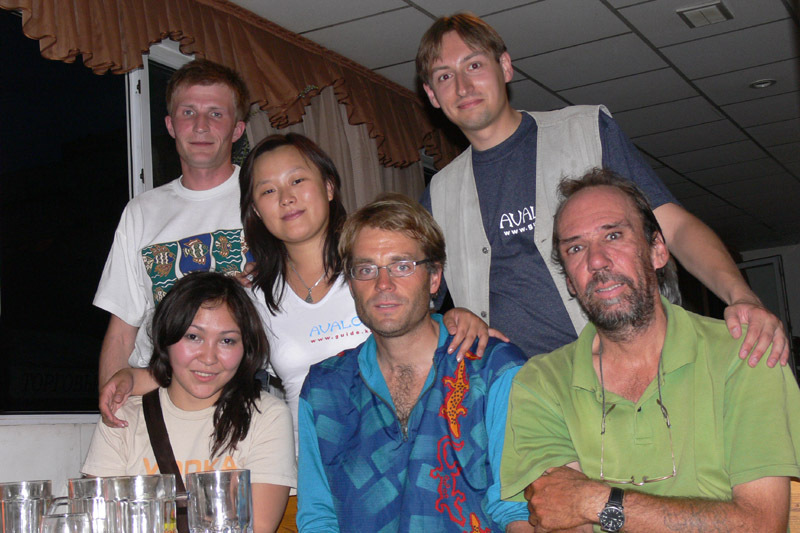 And I will remember for long that evening in the company of the Norwegian and the German, my best friend Sasha, an Almaty journalist Gaukhar and my girl-friend Lena who was going to Gorno-Badakhshan with me. That evening was remarked by amazing mixture of spirit and adventure in the talks, interesting stories about different places of earth and unbounded feeling of optimism and belief in our power. After meeting Herman and Peter I regretted more our going to Gorno-Badakhshan not by bicycles. But it could not be helped for the time limits of the journey did not let us make our way in the saddle. The night had already begun falling on the mountains, but I still kept recalling the moment when I got an idea to make this journey deep into Central Asia, the journey more extreme than the previous ones. Perhaps, these thoughts appeared in my mind after I became profoundly interested in ‘The Great Game’ between the Russian and the British empires in this rather large region in the second half of the 19th century. The history of this ‘game’ abounded in exciting events, the participants of which were the peoples inhabiting the Pamirs, Hindu Kush, Kunlun Shan, the Himalayas, Karakorum and Tibet. And despite this happened relatively recently (of course, in the scales of the world history), this period was marked by a great number of adventure lovers and by lots of scientific discoveries in various fields. So, what did I know about Gorno-Badakhshan before I got into that corner of the globe, quite distant from our habitual civilization? Maybe, a tiny bit more than an average human whose knowledge is confined to news on drug-trafficking and figures of bearded Mujahideens. I knew the names of the main ranges of the Pamirs and the geography of those places in general; I heard that they were inhabited by people professing one of the most liberal currents of Islam, Ismailism; I dreamt of ancient fortresses of the Wakhan Valley; finally, I read that the war had ended as long ago as 1996, and it was quite safe there now. Despite the war in Tajikistan has long ago gone down in history, the image of a hot spot stuck to the country, so firmly that it is rather difficult to fight against it. In minds of ordinary people the words ‘Badakhshan’, ‘Murghab’ or ‘Pyandj’ associate only with military or close-to-war themes and with strong belief that the situation is still the same there (and, moreover, it will always be the same). We were in to go there and try to destroy this myth that had so strongly rooted in people’s heads. A very convenient time for realizing ‘the Pamiri dream’ was the summer of 2007, when rather a remarkable character called Andre was abiding in Khorog. Being a friend of my friends, this native of Germany had for a long time worked in post-Soviet countries on various humanitarian and ecological projects. From the very beginning he contributed a lot to our fate, including his aid to get a permission to visit Gorno-Badakhshan Autonomous Region. He also let us stay in his house in Khorog for as much time as we needed to. Thanks to him and his acquaintances in the region, our trip to Khorog was easier in terms of transport as well. The night passed rather fast in the car. Having arrived at Osh early in the morning and telephoned the office of ACTED organization where we had a commitment concerning our delivery to Murghab, we left Osh at about dinner time. We moved southwards in an UAZ belonging to Murghab office of the organization mentioned, accompanied by three Kyrgyz: Turat, Akim and Abdullo. The famous Pamirs highway begins from Osh and goes right to Khorog. All over its 728 kilometers it represents not a best highway. In some places absence of 5 or 6 meters of the road (not the pavement but the road itself, because most of the bridges have been destroyed by mountain torrents and landslides) is almost a rule here. But it is not fearful because not amateurs but professionals drive along the Pamirs highway. On their UAZes they would cautiously go down one part of the road along the steep slope, cross a river flowing via the lacking fragment of the road (which happens very often), and then in the same intricate way they would climb the next piece of the road, once asphalted but destroyed by the time and natural cataclysms. The Trans-Alay mountain range, or more exactly the boundary pass Kyzyl-Art, is in a way the gate to the Eastern Pamirs , the highest after Tibet upland in the world with the average height of 3500-4000 meters, salty lakes, dry and clear air and scarce vegetation. From the very Kyzyl-Art right to Karakul Lake stretches the Valley of Death, Markansu, with grey dusty pebble stone and almost no vegetation. Until the thirties of the last century the landscape was much gloomier: before the construction of the highway in these places, hundreds of dead pack animals laid all around the valley, which died because they could not bear ties of the caravan life and were literally mummified thanks to cold and dryness. These places are real hell for those suffering from acute mountain sickness. Rarefied mountain air, fluctuations in temperature and altitudes, inevitable physical activity and fatigability caused by moving can all result in unpleasant symptoms of this disease. Besides remedies created by official medicine, local people advise strangers to use such folk remedies as kurt and dried mulberries for centuries. The former medicine is popular with many Central Asian peoples and represents a sour-milk product shaped as small balls. And dried mulberries are called here just Pamiri chocolate. Of course, mulberry does not grow in the Eastern Pamirs, but the western part is rich in it. The berries contain a lot of glucose, which is considered useful when traveling at a height with the content of oxygen is less then usual. Southward of Lake Karakul travelers moving to Gorno-Badakhshan have to pass the famous pass Ak-Baital situated at the height of 4655 meters. This place is the highest point in ex-Soviet Union, where the highway had been lain. In the places between Kyzyl-Art and Ak-Baital (obviously due to their being situated close to the frontier – Kyrgyzstan in the north and China in the east) one can easily meet argali that is often called ‘Marco Polo’ here. To tell the truth, at first I could not understand an explanation to this. But when I came home and searched the books, I found out that it was considered that it had been this Venetian traveler from whom the Europeans had known about this animal. And now the name of the renowned Italian is immortalized in the Latin name of the Pamiri argali (ovis ammon polii). At present flesh of the argali inhabiting mostly the Eastern Pamirs is considered one of the most exclusive specialties despite its being included into the Red Book. Our way from Osh to Murghab lasted for about twelve hours with small breaks, and we arrived at the place far after midnight . Turat invited us to his place, and at about half past two at night we were drinking tea with him and his wife. Here, in Murghab I already began to realize that hospitality is one of the main features inherent in the people of the Pamirs. The Pamirs Post (predecessor of present-day Murghab) was founded by Russian military men as early as 1829. 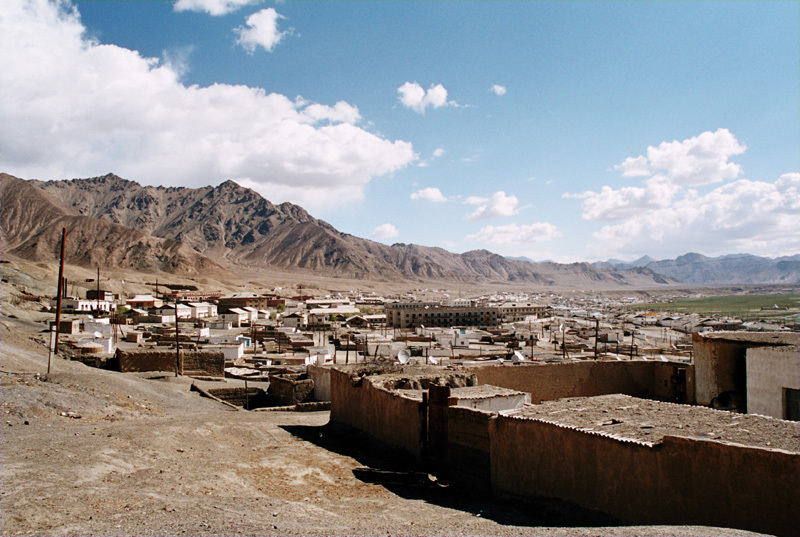 Nowadays this kishlak (mountain village) is the only big settlement in the Eastern Pamirs. It is also one of the most high-level places all over CIS, for the height of Murghab is 3650 meters above sea level. Almost nothing grows here and local people must live only on brought-in products. At the same time they are engaged in cattle-raising, breeding sheep and yak, rather exotic for us but adapted for living in high mountains animal. During our sojourn in Murghab, when we were searching for a car, roaming along the bazaar and tried to get registered in the migration police (in which we did not succeed because we had been kicked out to their Khorog counterparts) we managed to get acquainted with three Swedish people going to China; a company going by car and consisting of a New Zealander, an American and an Australian that we met later in Khorog; a French couple in a car that represented a mobile-home, going northwards to Russia together with their children. It was a nice surprise for me to know that traveling in the Pamirs is being more actively developed, and what is more pleasant, that the first people here are, as usually, adventurers going without vouchers and any help of tourist agencies, at their own risk, the most interesting people in the world, in my opinion. In Murghab we met a person the acquaintance with whom became deeper because we spent the following four days of our trip with him. Wakhib could be said to be 20 and even 35 years old, judging by his appearance. His young face and partly grey hair inspired such uncertainty. And his ‘service record’ included traveling over the bigger part of the globe – Europe, Central Asia, Africa, Northern and Southern America. Wakhib had for a long time lived in France, was married to a French woman, but originally he comes from Afghanistan . His journey around the Middle Asia had been lasting for four months, and at the moment we met him he was planning to go along Yashilkul lake, then get into Khorog and reach Kabul where he was awaited for by his friends. It was not very difficult for him to travel around Tajikistan because, despite he did not know Russian, he could speak Farsi, which was evidently better in these circumstances. For the Tajik and Pamiri people who speak languages related to Farsi could understand him quite well. In a small cafe at Murghab bazaar we shared our plans for the future and decided that we would go across the Wakhan range together with him. Wakhib slightly changed his plans concerning Yashilkul. He decided that first he would go to the mountains with us, and then, from Khorog he would return to Alichur and make his trek along the lake famous for its beauty. From Murghab we had to get to Khorog as soon as possible, in order to find Andre there, who was going to leave for Dushanbe the other day. The bus station in the village is a patch near the bazaar with a few cars going to Kyrghyz Osh, Khorog or any other settled points of Gorno-Badakhshan. Our search did not last long: we agreed with a driver of an UAZ who was going to Khorog in the afternoon. Having beaten down the price for fare for several times, we continued our walk. But when we returned to the office of ACTED at about 2 p.m. to meet the car that had to drive us to Khorog we were met by exclamations of the girl Zarina who was working there. As it turned out, she was about to look for us. The point was that at that very moment a car of the French energy company INEO was to leave for Khorog. And its driver offered to help us in settling down our transportation problem free of charge. In a minute our stuff was packed in his ‘reno’, and in half an hour Mansur (that was the name of the driver) was telling us various stories about his life, most part of which related to his military past. It was at the same time that he promised to drive us to Khorog in four hours, instead of average statistical six or eight. 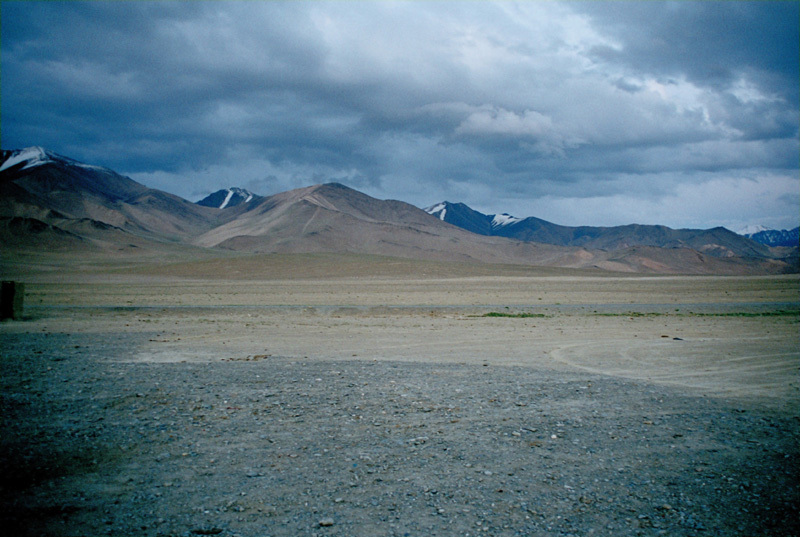 The road from Murghab goes southwestwards across the wide Alichur valley, famous for its lake Yashilkul, rather a popular place among foreign tourists. Alichur is also famous for one can taste a very rare fish osman there (we were lucky to do it on our way back from Khorog). The Koitezak pass (more often referred to by natives as the Shugnan pass) is a kind of boundary where the expanses of the Eastern Pamirs end and the western part of this mountain country opens. 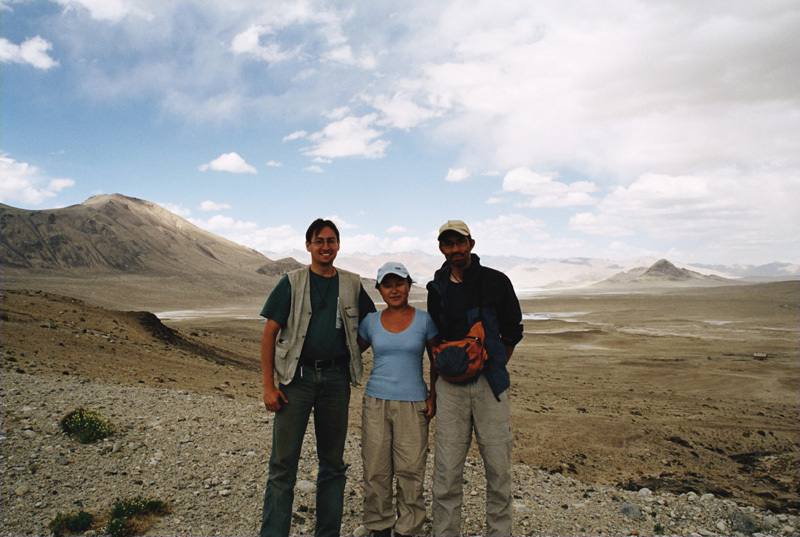 The Western Pamirs is renowned for big contrasts in altitudes, and that is why low-level river valleys of Ghunt and Shokhdara are much more populous than the lands of the Eastern Pamirs, the latter striking by their desert landscapes at first sight. Indeed, westwards of Koitezak there begin valleys smothering in verdure, and you cannot believe that an hour ago you were passing lifeless desert where any vegetation seems odd and alien and the only masters of the wide expanses are the winds lifting dusty clouds. I should note that Mansur did not let our expectations down and at about six in the evening our company was entering the biggest and actually the only town of Gorno-Badakhshan autonomous region, Khorog.